Muscle memory specifically when associated with learning to play an instrument proves to be a really amazing thing. The memory is not really in your muscles but it information is passed and retained with your nerves associated with muscles. Repetitive movement and practice of a particular activity brings a change in how your brain reacts to that movement. Practice and repetition build your muscle memory and thus for those repeated motions; your brain begins to respond quickly with enhanced power and faster motion. 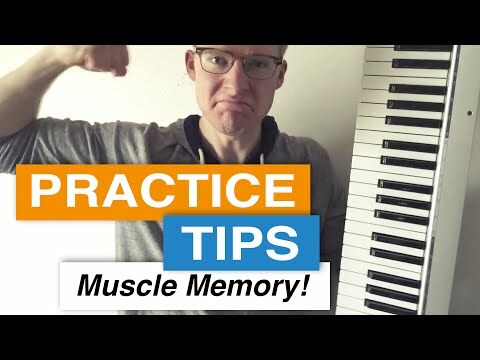 How muscle memory can help pianists? Muscle memory remains for a very long time and this is why you don’t really forget typing, riding bicycle or for that instance playing an instrument easily. Even if you take a break from certain activity, as you get back to it your muscle memory will be quickly regained. This proves helpful for professional pianists. The science behind muscle memory staying for a longer time frame is the reason why a skilled pianist can do complex hand movements with less motor network used than an inexperienced new pianist. Muscle memory is similar to programming and it is like your movements are programmed so when you begin to play piano; you no longer have to think more but you just perform. This is why experienced pianists who have practiced a lot have their muscle memory already developed and thus they can perform without thinking. This is why they can spare more time for learning new techniques and pieces over piano. Thus it is truly termed to a musician’s secret weapon as an experienced pianist play notes correctly without thinking about it and thus can focus on other things or factors related to playing music. Practice at a slow pace and do not rush while practicing. You must not focus on learning entire thing in a few hours rather break up your musical piece in parts and pay attention on learning one part at a time. Slowly and gradually work to increase speed once you have gained complete hands on a part at its slow pace. Muscle memories once developed are difficult to reverse so focus on building good memories. Correct and Consistent Practice is Important! The term ‘Practice makes a man perfect’ is true but the phrase becomes perfectly true when you add Correct and consistent practice makes perfect. This memory is built with repetition of a particular activity and the more you do of something; stronger will be its memory within your nerves and brains. But the memory you build doesn’t know whether you are doing something good or bad. This means that if you practice a piece while making mistakes over and over again; there will be chances that you will become really good at making those mistakes. Although you were making consistent efforts but in incorrect direction and thus your entire work can result in failure. This is why it is important to concentrate on consistent and correct practice. As it is easier to learn something correctly for the first time rather than trying to correct something after you have memorized it. When you constant practice incorrect techniques, it could actually work against you. Apart from practicing, your attitude, urge towards learning as well as your sense of being able to perform can work positively for your muscle memory. This means that factor of confidence would also affect your muscle memory. Design short intervals for practices and practice regularly for enhancing your muscle memory. It would be best if you can work for two practice sessions each day. One of the best ways of teaching and training your brain and muscles for playing piano with precision is to experience slow practicing. When you are working with new skills for building your muscle memory, make sure you work in a variable environment. This you can do making certain variations in your environment. For example if you are practicing a piece, rather than simply playing it slowly you can turn it in to a game-like activity. Once you have gained good hands on a new skill, perfect that newly learnt skill in a random environment. You can even set some distractions in your environment to further strengthen your muscle memory for that particular repetitive session. Always be mindful of mistakes and if you are making mistakes; make sure you correct them during the phase of learning. You would definitely not want to spend hours to correct your bad habits once developed in the form of wrong muscles memory. So it is best to rectify mistakes early during the phase of learning. Follow a proper flow when you are working to develop muscle memory. Be diligent, consistent and work with patience and concentration as doing so would need less efforts from your side for progressive learning. Patterns and structures are foundation of learning any musical piece on piano and thus it is important for a pianist to gain muscle memory. The idea is that as you practice over and over again, your brain gets trained and your muscles become more comfortable with your instrument and musical piece. Your trained brain and muscles play notes automatically and it makes your piano performance more interesting and much simpler. Be motivated and work for progressive practicing in order to carefully memorize and internalize a pattern in your muscles.